Operation with eNet SMART HOME app for Apple iOS or Android or with Gira G1. Visualisation of the Gira interface via Gira Control 9 Client. Fully encrypted wireless transmission (AES CCM 128-bit) from eNet Server software version 2.0. Wireless transmitter and wireless receiver for max. 32 eNet wireless DIN-rail mounting devices (eNet wireless receiver module DRA is not required). Internal eNet wireless and WLAN antenna. External eNet wireless and WLAN antennas can be connected. Functions: Switching or pressing, dimming, blind. Updates and configures eNet SMART HOME devices. Integrated telegram recording for diagnostics. Optional remote access via My-eNet portal is compatible to IPv4 and IPv6. The eNet server should be installed at a central location, where possible (e.g. ground floor) in order to guarantee good reception quality. Installation in a distribution box or sub-distribution with a metal housing requires an additional antenna. The additional antenna is to be placed outside the metal housing. The server is started up using the eNet SMART HOME connect web interface. To start up the server via the web interface, the start-up computer must have a current browser (e.g. Mozilla Firefox, Microsoft Internet Explorer, Edge, Safari, or Chrome). The power supply is required for power supply when installed. Wireless approval is valid for EU and EFTA countries. Not compatible with the Gira wireless bus system. A plug-in power supply unit is included in the scope of supply for mobile use of the eNet server. 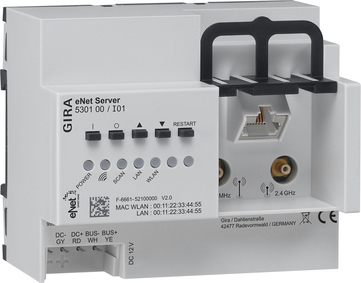 With this firmware update the Gira G1 can also be used as a client in systems with a eNetServer. To perform the update the Gira Project Assistant from V3.1 is required. Please follow the instructions in the enclosed documentation. By downloading the firmware you accept the limited functionality.